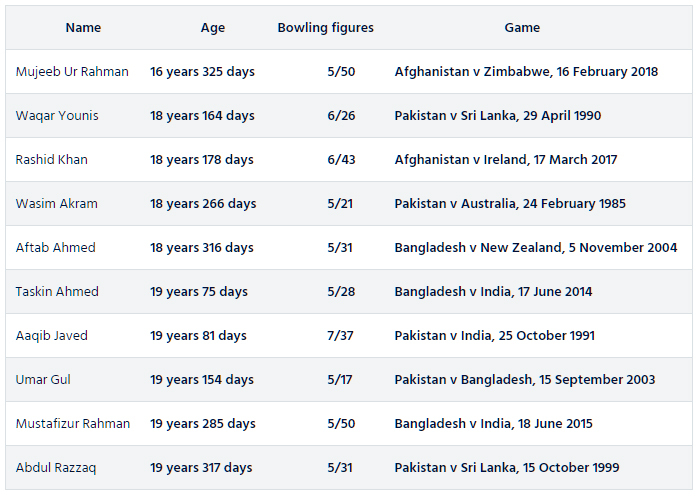 Afghanistan’s Mujeeb Zadran last week became the youngest player to take an ODI five-wicket haul during Afghanistan's win over Zimbabwe in the fourth ODI - and in the process he eclipsed some big names. Zadran, who hails from Khost, has enjoyed a meteoric start to his international career. The 16-year-old Afghanistan spinner, whose uncle Noor Ali Zadran is also a national cricket team player, has bamboozled just about every batsman he's faced so far, with the element of 'mystery' surrounding him adding to his aura. According to the ICC, he has grasped every opportunity that has come his way and has looked at ease every time he has stepped up a level. In many ways his rise mirrors that of his country, with Afghanistan improving with every game they play. Playing alongside fellow teenage spinner Rashid Khan, Zadran has a clear example to follow. The duo have been devastating in the current series against Zimbabwe, taking a whopping 31 of the 53 Zimbabwean wickets to have fallen across the ODI and T20I series between them. Mujeeb could hardly have imagined a better start to his life on the big stage. At the ICC Under 19 World Cup 2018 in New Zealand he claimed six wickets at an average of 26.66 and an economy of 3.5 as Afghanistan reached the semi-finals. His performances are such that it wasn't even particularly surprising when Kings XI Punjab paid approximately $630,000 USD for his services at this year's Indian Premier League. But it was his most recent performance, in the fourth ODI against Zimbabwe in Sharjah, that really caught everyone’s eye. Bowling his unique mixture of off-spin, leg-spin and googlies he opened the bowling, ripping out the Zimbabwean openers for single figures before returning to mop up the tail and secure figures of 5/50 and another win for his side. Those figures - 5/50 - are what gave him another remarkable achievement. At the age of just 16 years he became by far the youngest player to claim a five-wicket haul in ODIs, surpassing Pakistan legend Waqar Younis, who claimed 6/26 on the same ground 28 years ago. The full list of those he has surpassed emphasizes the scale of his achievement at such a young age. At only 16 years of age, Afghanistan’s Mujeeb Zadran is making waves on the international cricket stage after taking a remarkable five wickets in a recent ODI.